Seeing is believing: A factory demonstration provides invaluable assurance that you’re selecting the best machine for your business and its future. If your company is considering adding or upgrading bindery equipment, you want to be sure that the investment meets today’s needs, while having the capability to expand for future growth. There is perhaps no better way to assess those requirements then with an on-site factory demonstration. We can arrange for you and your team to visit one of our factories in Switzerland, Germany or the United States to see the application of interest. Here a customer is being shown how the milling and spine prep is going to provide a quality book. 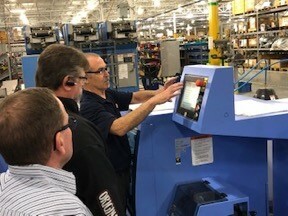 In this image, a customer is learning how easy a makeready is using the seven-step setup guide on a new saddle stitcher. What’s invaluable about a scheduled demo is that it is totally focused on your specific needs—your unique products, customers, workflow, etc. Having Muller Martini senior service engineers demonstrate and explain how our equipment handles your particular challenges provides the added assurance that this purchase provides the investment protection you need. If new or upgraded bindery equipment is in your plans, definitely take the time to visit one of our factories and get a close look under the hood. ← Why not consider adding new capabilities that not only differentiate your business, but make it more efficient?